My introduction into the stock market using Betterment. The stock market is a massive, unpredictable, and confusing beast, but don't let that stop you from profiting from it. With the right knowledge and commitment, you could become a millionaire from investing a modest amount every month for the next twenty years. Better yet, you could potentially retire even sooner if you're willing to invest more and more of your income. This may sound daunting, but it’s easier than you might think. First, let’s talk about the stock market. A stock is a little piece of a company that you can buy and own. If the company grows in value, the price of that stock increases and you now have more value than you put into it. Sell it, and you make a profit. But what if that company crashes and goes out of business? You lose all you put in. But let’s say you put your money into two different stocks. One company grows like crazy and triples in value while the other tanks. You lose that 50, but the other 50 is now worth 150! Profit! This is great, but very very few people can actually predict the stock market consistently. So how can we get around the volatility of the market? With diversity. Instead of picking and choosing where to invest, you can simply invest in everything! Doing so prevents you from being struck by one company’s poor performance. But what if the stock market crashes? This is one of the main concerns any investor has. In 2008, stock prices plummeted and people lost millions. Five years later, however, the values of the stocks reached the same high they once were. Now, those stocks are worth much, much more! When getting into investing, it’s easy to get caught up in these fluctuations. Prices rise and fall every day, but in the long term, the average market value increases by around 7% every year. This is thanks to the billions of people on this planet working hard and making new, better companies. Uh oh! Your thousand dollars cash has shrunk $20 this year. That’s because inflation takes about 2% every year. This isn't good; let’s look at something with some returns! As you can see, this didn't make much of a difference. An average savings account returns an embarrassing 0.06% every year. That’s not even one dollar for your thousand. The rate of inflation still takes home a trophy and gets a pizza party. Bonds are a very secure way of beating inflation. They are basically what you get for lending money to the government. On average, based on the last ten years, bonds will return 4.6% every year. Subtract the rate of inflation and you're looking at 2.6% in returns. Not bad! You're not only keeping your money secure, but you're earning some in the process. Now we're talking! $60 cash in one year from an average year in the stock market (based on the average of the last ten years, 8.11%). This won't happen every year, of course, but over time, this will be the average. Looking at these numbers, the differences aren't totally mind-blowing. A total difference of $80 for sitting on potentially risky stocks. So let’s change our perspective and look at the course of twenty years and see what this $1,000 is up to. Keep in mind that the annual returns are based on the result of each year. This means that the money you earn through interest will earn money itself. Woah! The difference here is profound! We're not looking at an $80 difference now; this change is in the thousands! If you added just an additional $1,000 every year to your stocks (for a total of $20,000) you would now have $42,772.27! That’s the power of compound interest. So how do we get our hands on this free money? Well like I said, it’s way easier than you might think. There are these things called funds that do a lot of the work for you. A lot of big investment companies will try to convince you to sign up for a mutual fund. This is where you give money to a company and they invest it for you. They diversify your portfolio so you have pretty good overall security, while charging a small fee. When I say small fee, it’s usually between 0.5 and 1%. In the long term, this number becomes substantial. This little amount eats away at your annual returns, hurting the magnitude of your compounding interest. I was wrapped up in mutual funds until recently when I learned more about index funds. Index funds are the sugar daddies of the financial world. These funds follow an index of a huge group of established companies that generally outperform individually-managed mutual funds. The beauty of these funds is that they come with lower fees and higher returns. So why would anyone use mutual funds? It’s easy to get talked into those by an investment company. They want to be able to play with your money and charge a fee. But now you know that you can avoid that fee altogether! So where do we get started? Meet Betterment. 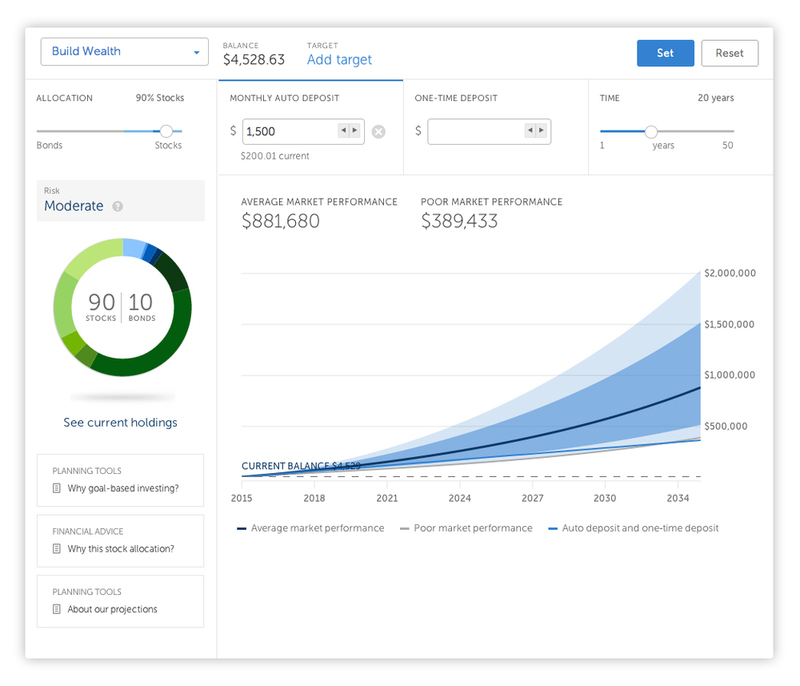 From their website: “Betterment is the smarter automated investing service that provides optimized investment returns for individual, IRA, Roth IRA & rollover 401(k) accounts.” What this means to you is that you get access to index funds at a low cost while requiring little knowledge of the stock market itself. When you get set up, you'll add a monthly deposit to get started. You can also deposit money at anytime to jumpstart your earnings. From there, you can just sit on your stocks and watch the market rise. Of course, like I said, the market will rise and fall. When it falls, you may end up with much less than you put in. If and when this happens, don't freak out; this is natural and happens to investors all the time. The more steady you are, the better your outcome. He was saying that when the market crashes, you should invest more money into it while stocks are cheaper. When the market is soaring, hold back a little and let your stocks grow for themselves. People get excited about any extreme market shift and end up investing poorly. Thankfully for us, we can just keep investing a steady amount month after month to reap the rewards. No one is stopping you from opening up an account today! You can start an account with a minimum of $100 per month. That number may look intimidating, but once you start depositing money, you'll want to put in more and more. Trust me. Click this link to go to Betterment and get a 60-day free trial! If you go there directly, you'll only get a 30-day trial. Better yet, I'll also earn a free month. Win win! So now you have a greater understanding of stocks, bonds, the stock market, mutual funds, and index funds. If you don't have a solid grasp on how you're going to retire, this is a great start. Now go get rich! Disclaimer: I am not a financial expert. The opinions here are solely my own, based on my extensive research on the subject. I encourage you to also do your own research and pick the right path for your money.